U.S. Payouts: Terms, Timing, Methods, Setup, Invoices, etc. Learn more about how RecruitiFi pays U.S. recruiting agencies and how you can get set up to receive your placement fees. The following article will give a comprehensive understand about how payouts work on RecruitiFi for U.S. agencies. We'll cover the payout terms, how to get set up, how to handle invoicing, and a few other common questions. If you're looking for information on international payouts, click here. If you need to update your banking info, click the 'X' next to your payment method. That will delete the bank account on file. Then go ahead add add your new account. DO NOT send an invoice to RecruitiFi. We keep an electronic record of your payment statement accessible through your account. Since RecruitiFi is the vendor, there are different fee and tax implications, and it's likely that whatever invoice you're generating has not accounted for this. If your company requires invoices to be created for internal record keeping, there is no need to send it to us. A live record of fees and payments is maintained and viewable through the RecruitiFi platform. This is the system of record. RecruitiFi acts as an escrow service on all hires. If a candidate fails to complete 60 days, the funds are automatically refunded to the employer. This prevents agencies from having to provide a refund, and allows Employers to post more jobs to third-party agencies, knowing that their money is secure until the guarantee has been met. Why does RecruitiFi require so much information to set up a payout method? In order to send large sums of money that are common in the recruiting industry, RecruitiFi and our payout processors are held to high standards of verification to ensure that we are in compliance with federal regulations like Know Your Customer (KYC), Anti-Money Laundering (AML), and Combating the Financing of Terrorism (CFT). For a more detailed answer, please review this help article. 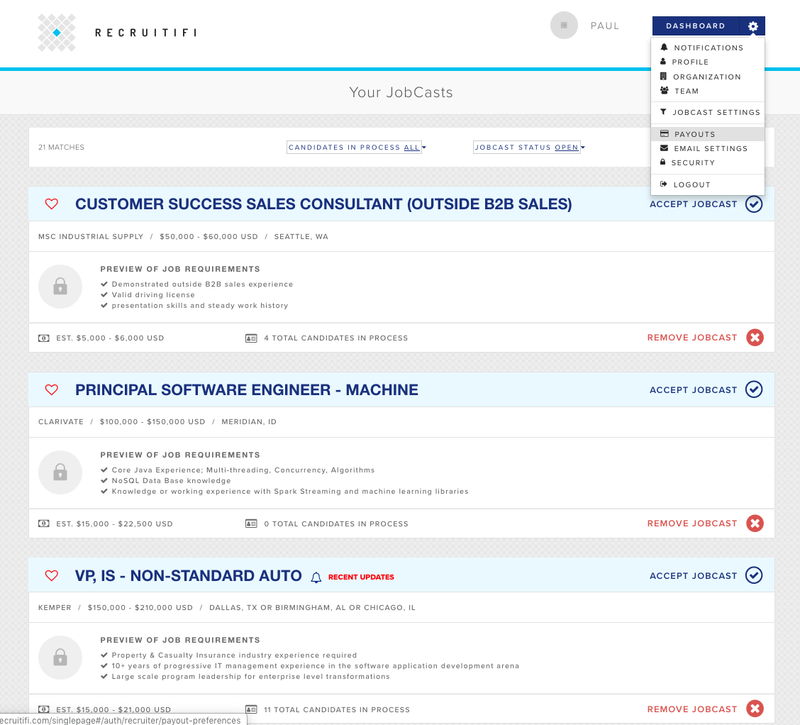 The fee that you see on the JobCast is your take-home fee for that Employer. RecruitiFi does not charge additional fees unless there are currency conversion and banking fees, which don't generally apply to domestic transactions. Like any ACH transfer, the funds typically take 1-3 days to reach your bank account, however, banks reserve the right to hold fees longer than this. RecruitiFi has no control over the timing of transfer and release of your fund, as it is dependent on your individual bank. You will always be paid according to the Terms, which means the first business day of the month following the candidate fulfilling the guarantee and the Employer making payment. While we recognize that late payments are a reality of doing business, we work hard to minimize their occurrence and lessen their impact on our agencies in a number of ways. RecruitiFi does credit checks on all Employers prior to accepting their jobs to ensure that we're only working with reputable companies. Our finance team works closely with the global accounts payable and TA/HR leadership at all Employers to ensure that invoices are being received, approved, and paid in a timely fashion. And in the case of late payments, we aggressively collect on your behalf by going straight to the global finance leadership at the Employer, bypassing many of the collection hassles that an individual agency may run into by trying to work their way up the chain of command.